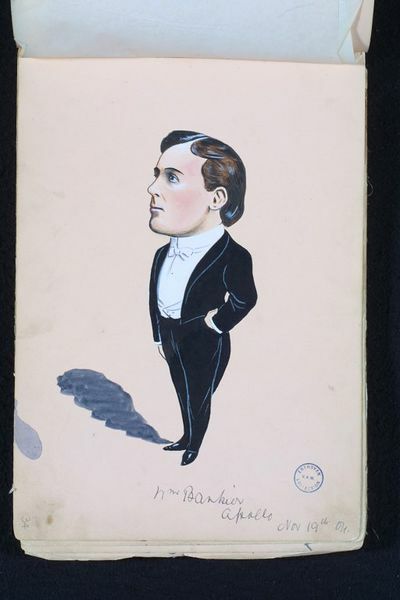 This caricature is of William Bankier, who was promoting Yukio Tani at the Grand Theatre of Varieties, Hanley, when Tani topped the bill during the week of 14 November 1904. It is one of the many superb caricatures of Edwardian music hall performers that were drawn by the artist George Cooke when he was based at the Grand Theatre. He compiled them in a series of albums. He also drew Yukio Tani. Bankier, born in 1870, was better known on the music hall stage as the strongman ‘Apollo the Scottish Hercules’. He was a wrestling promoter who founded the British Society of Jiu-Jitsu with Yukio Tani, for whose variety appearances he acted as agent. Bankier was a great strength athlete with a genuine act in which he harness-lifted an elephant. He demonstrated his versatility by performing a backward somersault over a low chair, carrying a 56-pound weight in each hand. He would jump over a chair carrying a weight of 112 pounds. Standing on two chairs, he would juggle two dinner plates while lifting a man overhead balanced on his right hand. He was one of the outstanding wrestlers of his day and a superb showman. The Variety Artistes’ Federation appointed him ‘King Rat’ in 1912. Pen, ink and wash caricature on pink paper of William Bankier known as 'Apollo the Scottish Hercules', full-length, wearing a black evening suit, white shirt and white tie, with his left hand in his pocket. This caricature is of the strong man William Bankier (b.1870), better known on the music hall stage as 'Apollo the Scottish Hercules'. Bankier was a wrestling promoter who performed his strong-man act on the hallls for several years, and was also the agent of Yukio Tani the Japanese jiu-jitsu expert for all his music hall appearances. Bankier opened the Apollo-Saldo Academy for wrestling in London's west end, and was a great strength athlete with a genuine act in which he harness-lifted an elephant, and to demonstrate his versatility, performed a backward somersault over a low chair, carrying a 56 lb weight in each hand. He would jump over a chair carrying an 112lb weight, and standing on two chairs would juggle two dinner plates while lifting a man overhead balanced on his right hand. He was one of the outstanding wrestlers of his day and a superb showman, appointed 'King Rat' by the Variety Artistes' Federation in 1912. The caricature comes from the first of several albums compiled by the graphic artist George Cooke, featuring performers working in music hall in the early 20th century. The album is dated 1903-4-5. 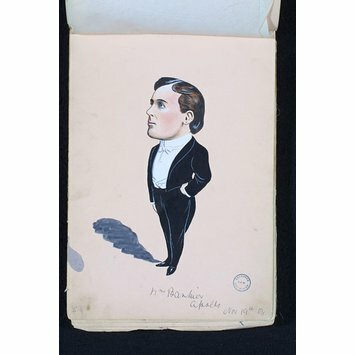 Caricature of William Bankier (b.1870), known in the music hall as 'Apollo the Scottish Hercules', from an album of caricatures drawn by George Cooke. Dated 19 November 1904.